Cost to install a bathtub. Prices for installation and replacement. Costs for a bathtub installation vary from $480 to $1,450 or even more for high end custom work. There are numerous of factors that affect the final price to get a new tub installed. Typically bathtubs last long enough and its replacement requires once it’s damaged or during a complete bathroom remodeling project. Itemized estimate from a contractor will reflect the cost of a new tub installation added to the total remodeling expenditures. Licensed plumber will charge $500 - $750 for free standing standard bathtub installation. If drain or water pipes have to be replaced or moved in to a different place the price might increase up to $850 - $1100 or even more if opening a floor or ceiling will require while accessing the pipes. 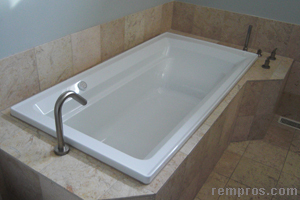 Simple 5’ wall to wall acrylic tub typically will cost $600 - $650 to get installed. Corner Jacuzzi might be 30% - 40% more expensive for labor. Cost to install bathtub faucet and hand shower normally vary from $150 for standard installation with ready plumbing to $800 for custom waterfall or if drilling holes in the tub will be necessary. It is easy and not expensive to perform the installation of drop in bathtub if the opening is according to a new tub size and all plumbing ready. If a new bathtub has a different dimensions or drains placement the work might be estimated up to $950 - $1,700. Building new supports and tub surrounding will escalate the price up to 45% - 150% and the finish work will increase the cost even more. All additional work plumber typically will estimate at $45 - $55 per hour with $200 - $250 minimum charge. If it is a jet bathtub and require electrical power line installation electrician will charge $40 - $50 per hour to perform all required work. Demolishing, reframing walls, removing tile and backer boards as well as fixing everything will be estimated separately based on hourly rates of installer and time spend. Replacing old galvanized pipes to copper using brass or dielectric fittings, relocating bathtub drains as well as building supports for a new bathtub will increase not only labor cost but materials expenses as well. Bathtub replacement will be charge at much higher rates and usually will be estimated only after contractor will inspect the area and analyze what will be involved. Standard enameled steel 60L x 30W x 16H might cost as low as $160 - $210 from the shelf of a local retailer. At the same time prices might go up to $4,450 - $6,050 for a deep soaking walk in or hot spa with jets. Materials expenses will vary from a couple hundred to a few thousand depending on what will be involved during the bathtub installation or replacement. How much did you pay for bathtub installation?